Piriformis MRI usually does not show any evidence of structural pathology, although magnetic resonance neurography might provide some valuable clues to the existence of sciatic nerve compression syndromes that are typically diagnosed as piriformis syndrome. MRI is the gold standard of medical imaging and is usually the “go-to” tool for investigation of any painful structural complaint. However, magnetic resonance is limited in its benefits for piriformis pain conditions, so in stark contrast to our usual recommendations, we can not suggest that all patients should universally undergo the procedure during diagnostic evaluation. MRI does provide some valuable information for some patients and the above mentioned variety of magnetic resonance neurography is especially useful for patients who are suspected of suffering from piriformis compression of the sciatic nerve. This dialog explores the use of magnetic resonance testing for piriformis pain conditions. We will examine the limitations and potential rewards of this expensive test. Magnetic resonance testing takes time, usually lasting for between 15 and 45 minutes, depending on the type of equipment used and the specific examination performed. During this time, patients will be confined to a small tube which can be quite claustrophobic. Open versions of MRI are available for patients who fear tight spaces, but the quality of the images produced suffers considerably. During the test time, the patient will have to remain motionless, which can also be challenging and uncomfortable. The test is not painful, nor is it invasive in any way. Some evaluations benefit from contrast dye, which may require an injection, but this is rarely used for piriformis MRI analysis. Once the test is complete, images will be “read” by a staff radiologist and transferred to a disc for ease of distribution to individual care providers for further diagnostic evaluation. MRI might visualize specific injury to the piriformis muscle. MRI will not likely provide much evidence to support RSI syndromes that affect the piriformis muscle. 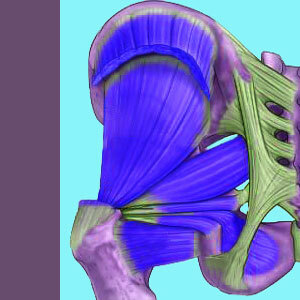 Likewise, MRI will usually not provide much, if any, evidence of muscular imbalances that might exist regionally. Some MRI studies will display the path of the sciatic nerve and might therefore be able to identify atypical positioning on the nerve in relation to the piriformis muscle. Magnetic resonance neurography goes one step beyond this, allowing the diagnostician to visualize the path and possible functionality of the sciatic nerve directly and clearly. MRI may be inconclusive for diagnosing piriformis syndrome, despite potentially identifying atypical sciatic nerve placement. However, magnetic resonance neurography is more useful and is therefore recommended for all patients who are being evaluated for possible piriformis compression of the sciatic or pudendal nerves. MRI is an expensive test that might not always be covered under medical insurance. When the test is expected to generate positive diagnostic results, coverage is usually provided. However, for cases of piriformis pain, most evaluation using traditional MRI might be unproductive and therefore excluded from coverage. If this is your situation, try to get an exception for coverage of magnetic resonance neurography, as this test is proven to be beneficial to the diagnostic process for piriformis syndrome. Regardless, do not allow any type of MRI to be the exclusive diagnostic tool used to create a verdict of piriformis pain. Be certain to insist on movement and manipulation-based tests as well, including the FAIR test for best and most accurate diagnostic results.